I like to blog everyday, but at the moment I am in Dallas, Texas at a conference and I’ve been here all day. I didn’t want to throw something generic up here just to post early or “save face” so I decided to blog today about deep personal thoughts that surround my life and business. I feel blessed in so many ways when it comes to my business and traveling is one of them. You see… being raised in poverty and in the projects, I never thought I’d be one of the lucky “few” to ever take a ride on a plane. I thought riding in a plane was for rich people. I even still remember the first time I ever went to an airport. I was a teenager, about 16 years old, and I took a ride out to O’Hare airport with my best friend Cassandra. Back then you didn’t need a ticket to go to the gate, you didn’t need luggage or clearance… there was no high-tech security. You just went. I sat with Cassandra and I we watched people from all over the world taking off and landing. 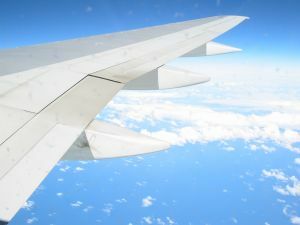 I thought… “wow, if I can go on a plane ride just once in my life how amazing would that be?” Little did I know it would one way be a common part of my life. The first time I rode on a plane was when my VERY VERY first business attempt had failed in California. I was burned out trying to sell encyclopedias door-to-door and ready to pack it in. My aunt Gale sent me a one way ticket from LAX to Chicago and I was so excited I hung out in that airport all day. I think I was there for about 8 hours. I had to go to airport police to get my luggage back because I left it on a chair and went perusing around the airport on an adventure! What a day! Just a few years later, after college, I was offered a modeling gig that had me on a plane several times a week for months. It was amazing… and I was bit by the travel bug. As glamorous or chaotic as traveling can be, depending on the day you travel, it is still one of the most treasured things I do. I have met people who have never been on a plane, and others who never want to. For those that don’t want to I wish I could share with them what it feels like to have the clouds beneath your feet. It makes you feel like you can do anything you put your mind to and really gives you insight and perspective that you can’t get in any other way. If you’ve never been on a plane before and you get a chance to travel by flying but are afraid I urge you to fight your fear and do it anyway. It truly is such a privilege. If you’re on flights all the time, like I am… I want you to take it all in the next time you do. Look at the clouds beneath your feet. Look at how trees look like blades of grass. Consider the millions of people who have not, and will not, ever have that experience. When was the first time you flew? What was your adventure?